PC Gamers out there give a lot of emphasis to the cabinet they plan to house their gaming rig in. 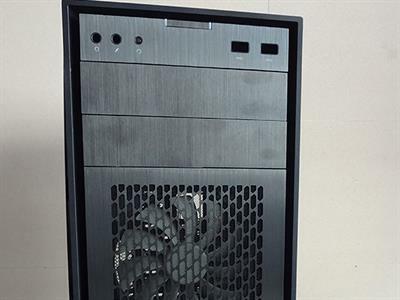 The Corsair Obsidian 450D cabinet is a mid tower high airflow ATX cabinet with a window on the side to show off your mean machine. Read our unbiased review of this cabinet, its features, positives and things it can improve upon. stays cool even while playing the most power hungry game? is well ventilated and has good cable management capabilities? In this article, we review a cabinet that easily fulfills the above criteria and gives you a lot more. 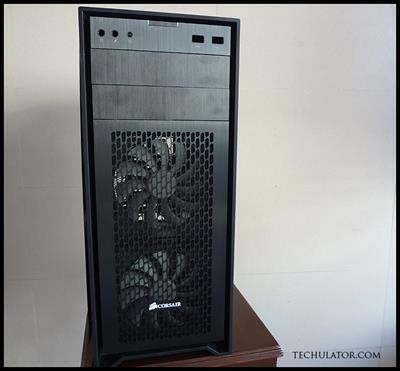 This is our full review of the Corsair Obsidian 450D mid tower ATX cabinet. Corsair is known to make quality PC components and is a well known brand in the PC world. The 450D is no less with a steel chassis and a brushed aluminium front panel that gives it the premium look. The front panel on the top houses the Power button along with two 3.5mm input/output ports, a tiny reset button and two USB 3.0 ports. Just below them are 2 removable slots for optical drives. Two 140mm Corsair inflow fans are located just below the removable mesh front panel and come pre-installed on the cabinet. The left hand side of the cabinet has a plastic/acrylic window that lets you see its interiors. The side panels can easily be removed with the help of 2 X 2 thumb screws. The location to connect a PSU is strategically placed at the bottom of the cabinet. A cut-out for the same is available at the rear bottom. Just above the PSU cut-out, there are a total of 7 PCI slot openings. These can easily be removed as thumb screws secure them from the inside. 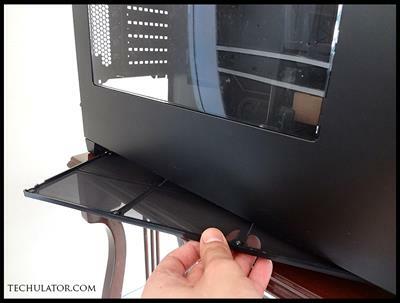 And on the top, is a cut-out for motherboard ports and as shown in the picture a Corsair 120mm exhaust fan also comes pre-attached with the cabinet. Unlike conventional cabinets, on the top of this cabinet rests a magnetic filter that can easily be removed. Upon removing it, you would discover an open area with a provision of attaching either 3 X 120mm fans/2 X 140mm fans or a full fledged radiator to dissipate heat. 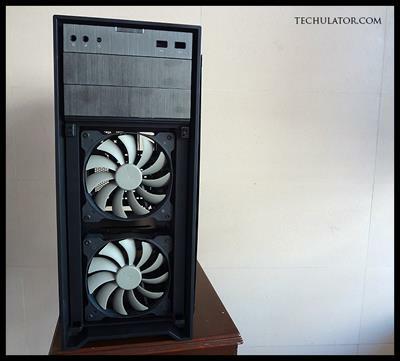 There's also a provision to attach 2 X 120mm fans at the floor level of the cabinet. 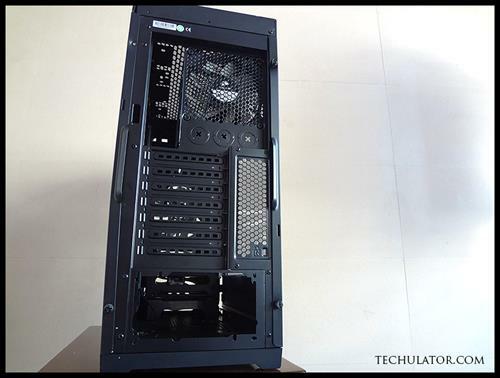 With a total of 7 fan mounts, this cabinet is easily one of the best in terms of airflow. 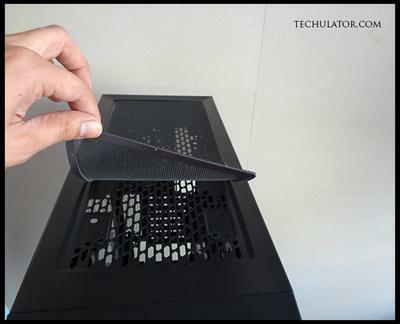 If you've been using a PC for a while and decide to clean it up on the inside one fine day, don't you find a huge amount of dust settled everywhere in the cabinet? Well, the Corsair Obsidian 450D has a solution to that as well. Apart from the front and top air filter, there's also a magnetic mesh dust filter that sticks onto the floor of the cabinet and is very easy to remove and re-attach. 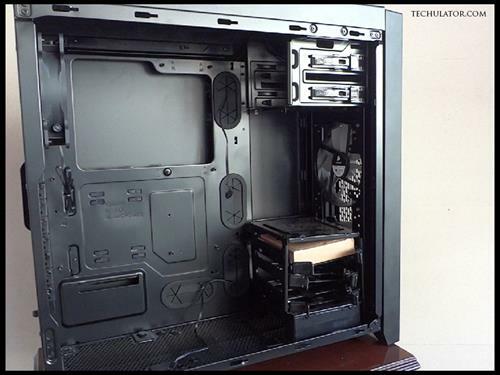 Once you open up the side panel, you can easily make out that this cabinet can take an ATX motherboard. 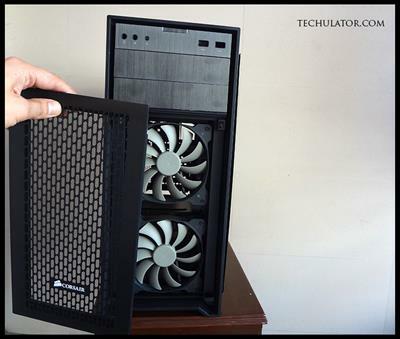 It can also easily fit a micro, mini and e-atx motherboards. At the bottom, you will find a hard drive bay that can take up to three 3.5" hard drives. Buy and fix another bay just above it and you can now affix up to 6 hard disk drives onto this mid size cabinet. If you're thinking of inserting an SSD or two in the empty HDD bay, please note that there's a separate SSD bay at the other end that can easily take two SSDs all wired up and ready to go. On the top right hand side, are two bays for you to affix optical disk drives if you need to. The best part, the entire SSD/HDD and ODD installation procedure to tool free. The two inflow Corsair fans as you can see direct air straight to the HDD/CPU and the PCI slots where you'd find the GPU. If you decide to install a radiator, be advised that the maximum compatible size of the radiator is 360mm which can be affixed at the top of the cabinet. The front area can take a maximum of 280mm, bottom area can take a 240mm and the rear area can take a maximum of 120mm radiator. This cabinet is designed keeping cable management in mind. There are plenty of places from where you can route your cables neatly and can tie them up using a zip seal. 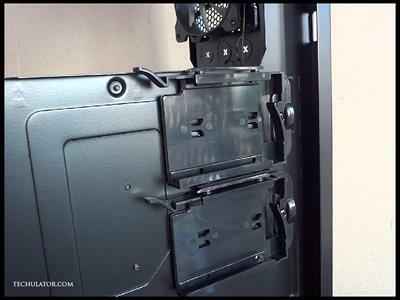 You would also find large holes in the cabinet that are rubberized for better cable management. Since this cabinet gives you an option of installing SSDs on the rear, its cables can also be routed from within and they stay at the rear away from your site. While there are a lot of good things to say about this cabinet, there are indeed a few things that we didn't like. At around 7Kgs in weight, this cabinet without any equipment inside felt on the higher side. Also, Corsair advertises its front panel to be brushed aluminium that is scratch and finger print resistant, however, during our testing we did manage to see a lot of scratches and finger prints on the front panel. Since optical disk drives usually come in either white or black colours, if you decide to install one on this cabinet, you may end up ruining the overall look of the front end. That was our third and the final gripe with this cabinet. 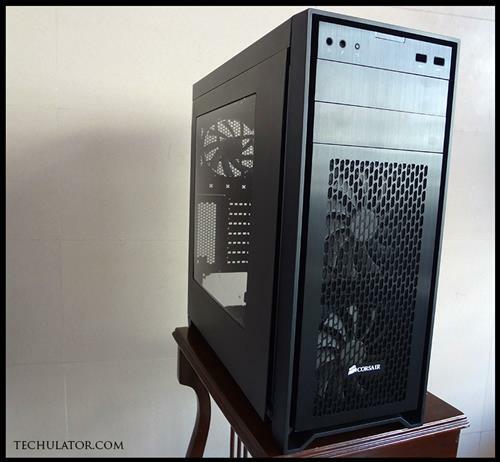 Overall, we found the Corsair Obsidian 450D cabinet to be a well thought-out and planned cabinet that was built keeping high-performance rigs in mind. If you are planning to buy a good quality cabinet for your gaming or regular needs, do check out this particular model before you make your decision. We hope you liked this article, please let us know in the comments section below if you have any questions or comments about this particular product. We will try to answer them as soon as possible. Also, please feel free to subscribe to our YouTube channel for regular video reviews on products like these.